League of Legends has already made significant changes to their gameplay, but now it appears Riot Games has more huge plans for the start of Season 3. It appears that Riot will be updating League's entire ranked ladder system, taking heavy inspiration from StarCraft II's tiered leagues. While the matchmaking system behind the ladders won't necessarily change, the new league system is aiming to bring a more measured and personal experience to the grander League of Legends experience. As far as actual gameplay or matchmaking goes, nothing will change for players. What will change is how players view and consider their rank and progress. No longer will skill and placement be measured by a specific number -- a player's Elo. Instead, the player-base will be broken into six tiers, from Bronze to Challenger, and then each tier will be broken into five divisions. 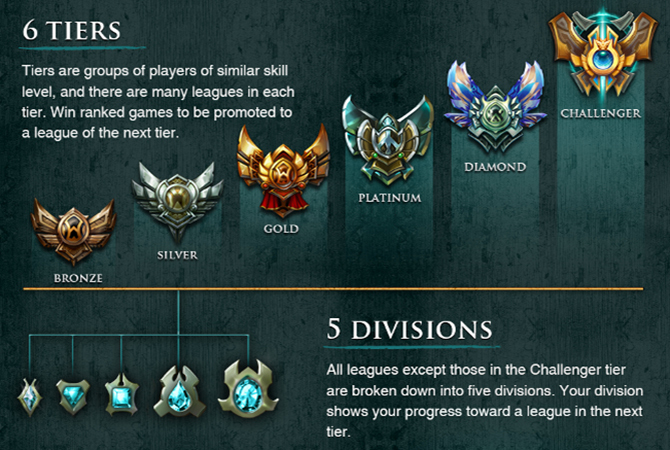 There are 5 basic leagues, Bronze, Silver, Gold, Platinum and Diamond. These leagues make up 98% of players. Within each league there are groups of 100 players known as local ladder boards. The points on this ladder isn't your actual ladder points but I'll leave that out. Upon playing your placement matches you're given a temporary rating and a display rating, the display rating shows how many points you have accumulated since you entered the group. Example is this, you're done with your placement matches and you hit silver league, you enter a league called "The Flying Zergling". You're currently rank 98 with 0 display points, you have 100 bonus points because you're new to the game (thus your skill level is estimatedly low). You win 5 games in a row, this causes the game to detect you as a smurf, your estimated/tempoary rating is now very high compared to your display rating and you now play versus Platinum players. Upon winning a game you will gain 40-50 points instead of the regular 10-14 points, if you lose, you will only lose 3 points but your tempoary rating will fall. Reaching top 8 in your group and/or reaching the next league (in the given example that would be gold). Now Star Craft II have 2 more leagues than the 5 aforementioned, there is the Master league and the Grandmaster league. The Master league contains the top 2% players while the Grandmaster league holds the 200 best players in the Region. Grandmaster players are invited to online tournaments and the top Grandmasters will automatically be qualified for various different things. This allows every player to feel they're getting somewhere while it also promotes pro play, it discourages smurfs and as a result encourages new players to join.